It doesn’t matter if the next superintendent is a he or she, but it does matter if the he or she is bilingual. The person should be good at communicating and love Los Angeles. And, the candidate should have been a teacher at one point in his or her career. Those are some of the findings in the draft Leadership Profile compiled by the search firm hired to seek candidates for the next LA Unified superintendent. In preparation for a public presentation tomorrow to the LAUSD school board, the search firm of Hazard, Young, Attea & Associates posted an array of responses collected from the surveys and from the 100-plus community meetings and interviews the firm held. The data dump includes breakdowns of the kinds of people they’ve heard from as well as all the comments posted on the surveys and all of the issues brought up at community meetings and by the board members. From the seven school board members themselves, the suggestions included finding a fast learner, a listener, someone who cares about children and education, and someone who is media savvy. A total of 9,461 people filled out the survey either online or on paper, and the same number of teachers filled out the survey as did parents (about 28 percent each). The number of students filling out the online survey was higher than the number of administrators (10 percent compared with about 8 percent). A total of 1,605 people participated in interviews and focus groups, and the number of “community members” attending was higher than the combined totals of teachers, staff and students. 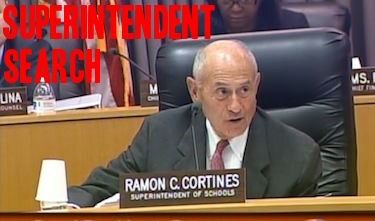 In a fascinating comparison with more than 70 other school districts and 35,000 responses nationwide, the search firm found that some of the characteristics wanted in an LAUSD superintendent were far different from the national trend. 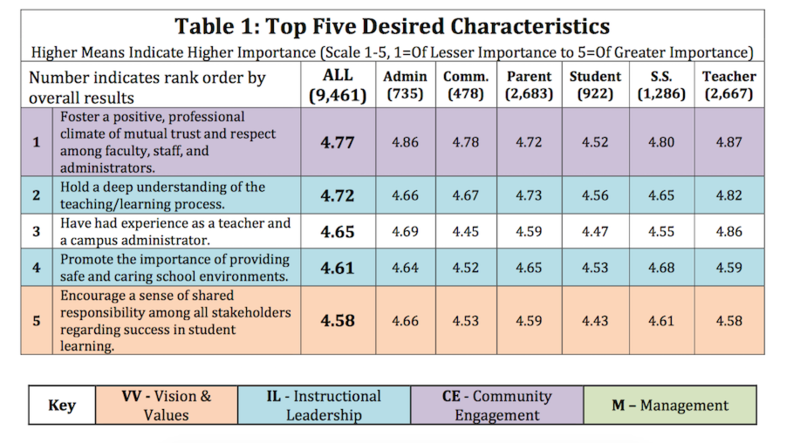 LA Unified stakeholders picked their top characteristic as: “Foster a positive professional climate of mutual trust and respect among faculty, staff, and administrators” while that was ranked 7th in the national ranking. The top national characteristic — “Have a clear vision of what is required to provide exemplary educational services and implement effective change” — ranked only 9th among LAUSD responses. The second highest ranked characteristic locally was more in line with the national trend. “Hold a deep understanding of the teaching/learning process and of the importance of educational technology” was ranked #2 in Los Angeles and third in the nation. And, the third highest LA characteristic of “Guide the operation and maintenance of school facilities to ensure secure, safe, and clean school environments that support learning” was ranked only 17th nationwide. In the comments section of the survey, 166 administrators, parents, teachers and staff wrote negative comments about Eli Broad and the proposal to add more charter schools to LAUSD. More than 500 comments involved charter schools, many expressing concern over how they could undermine traditional public schools. Some attribute declining enrollment to the expansion of charter schools, the report says. Attracting students back into the district is perceived as a critical issue for the new superintendent, according to the search firm. Staff members described recent leadership and fiscal challenges as “very difficult for everyone associated with the district,” but said that recent agreements concerning salary freezes, furlough days and layoffs have helped. The surveyors heard a lot of criticism of former superintendent John Deasy in all levels of the interviews and almost an equal amount of praise for Ramon Cortines, who took over for Deasy when he left last year. Forum and interview participants liked the new six Local District structure that Cortines formed, and “expressed an appreciation for a change in direction in trying to address issues often associated with a diverse student body by establishing a strong social justice approach.” This includes leadership for restorative justice, anti-bullying efforts, rights of LGBT students and others and commitment to equity. Ultimately, the characteristics must include the ability to manage the complex daily operations of LAUSD, have a decentralized leadership approach, communicate successfully to a larger community, and create a culture that welcomes parents into the educational process and engagement at school sites.